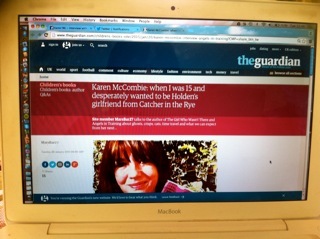 Crisps, cats, and wanting to be Holden Caulfield’s girlfriend! I was very chuffed to be interviewed for Guardian Children’s Books today – see my random witterings here. If you’ve nothing better to do, I mean! PS Remember I mentioned my ‘Everyday Angels’ giveaway a few days ago? Well, I posted the (very cute) winning nomination on my website today, if you fancied a nosey. Previous post ← My new book cover has arrived!